A lioness behind several different kinds of flowers. Every once in a while there is a fringe benefit of having a running blog and a bit of reach on social media. And that is when I get the privilege and honor to share the creative endeavors of my friends and fellow artists. Ashly is a long time peep who has even illustrated one of the older posts here on Writing About Writing (Why Others' Stories Matter), and is now working on trying to Kickstart her own project. It's an adult coloring book, and it's shaping up to be a pretty damned cool one too. (If you're new to adult coloring books, that's a book that's got a lot of smaller spaces and careful detail and is a bit more involved than most kids can handle, not a coloring book that would get an NC-17 rating or anything.) This one has got animals in it. There's nothing that says a younger child can't use them either. They just have a bit more detail. I've seen five year olds enjoy coloring them. And forty-five year olds. For just $15 (not that much more than you'd pay for an adult coloring book anyway) you get a book and to support an independent artist with a project. 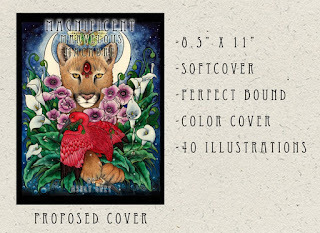 If you like coloring books, animals, visual art, or the macabre, check it out and maybe consider backing her efforts.